I think all homeowners have an area or room of their house that they neglect. For us, it’s our backyard. I have these grand visions of what I’d like to do, but the interior always takes precedent. For instance, we have a lovely pond and waterfall in the backyard, but our Better Homes & Gardens Bailey Dining Set is under the covered area adjacent to the house…kinda far away. I’ve always wanted to move the dining set out and closer to the pond to enjoy the serene waterfall, birds chirping and the occasional breeze, but I wanted to do a paver patio and all this other stuff before moving it. 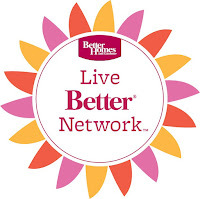 I really lucked out that this month’s BHG Live Better challenge was to use outdoor decor to spruce up an outdoor space because this was my chance to make it happen. Pee Wee was on board, as you can see. I finally decided that I should just move the dining set out there even if it’s on the grass because it’ll allow us and our family to enjoy our backyard more. We should enjoy the spaces we have NOW and not always wait for later. This outdoor/backyard makeover only cost about $100, but it added so much value to a neglected space. Living in South Texas means we get a lot of sun and heat, so finding a way to add some shade was my first priority. I was browsing the vast BHG product selection online and my attention was immediately on the BHG Cabana Stripe Outdoor Umbrella. I will say it’s more a black/tan color than black/white, but I love it anyway. We had it installed in under five minutes. The 9′ umbrella makes sitting outside in the middle of the day a pleasure. There’s lots of shade, plus it has a feature where you can angle it in a particular direction in case the sun is beaming down in one area. Totally worth $50. I also took this opportunity to invest in some melamine outdoor dining pieces so I could leave the breakable stuff inside. I opted for a set of the beautiful Rustic White Swirl Melamine Dinner Plates and matching bowls that have an upscale, stoneware look to them yet are outdoor friendly and dishwasher safe. 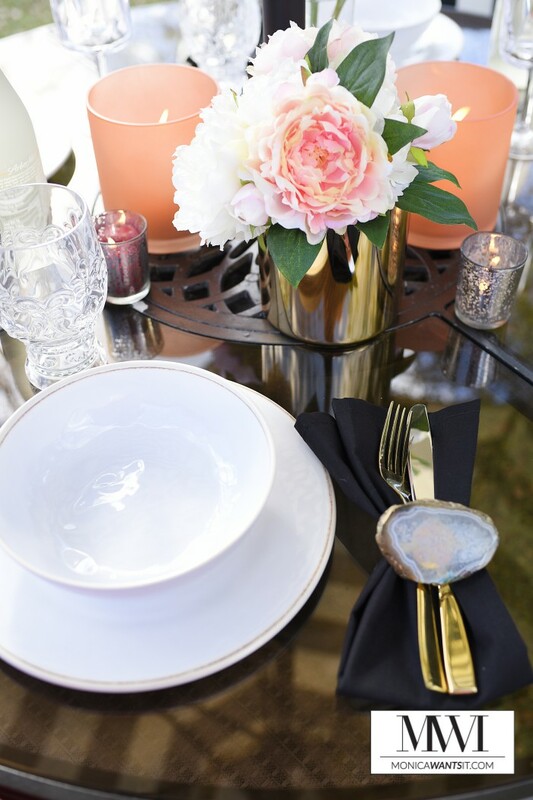 They pair beautifully with my mercury glass votives and gold flatware. I also bought a pair of peach-colored frosted glass hurricane candle holders (they hold pillar candles) because that color is my obsession right now. They also have a teal/aqua version that is just as stunning. I have some citronella pillar candles in there to help combat pesky mosquitoes. The frosted finish has a beachy feel to it, and overall these candle holders just look downright chic in any space– inside and outside. 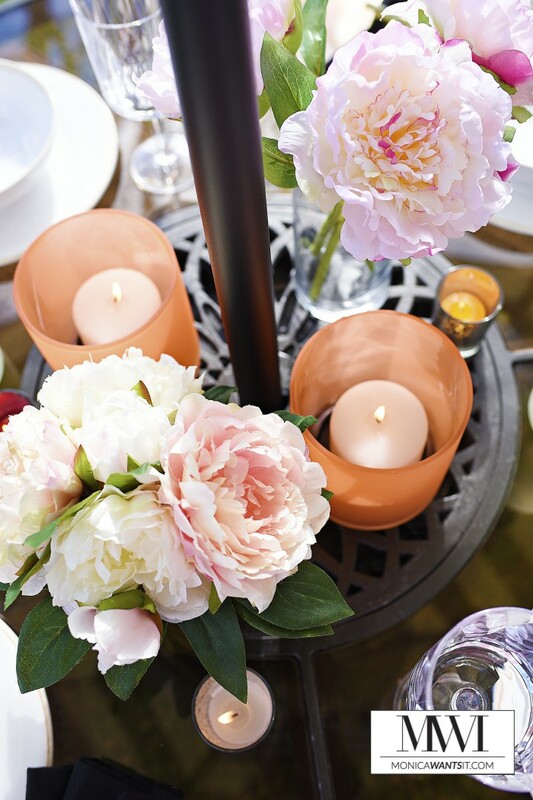 My favorite time of day is at dusk when there’s still a bit of sun peeking out, but it’s darker, cozier and perfect for sitting around the candlelit table and enjoying a tasty meal with the family. Pee Wee enjoys the space anytime of day since he has his own space in the shade. I’m sure I’ll need to find him a pet hammock soon enough. Although we’ve had our dining set for awhile, it’s worth mentioning that the BHG Bailey Dining Set is phenomenal. The trestle base is beefy, and the amber colored glass top is unique and easy to clean. The best part, however, is how AMAZING the chairs are. The chairs are roomy, they swivel/rock, and the oversized chair cushion is incredibly kind to your back and neck/head. I could lounge on them for hours and hours. One time I even fell asleep in one when reading a book. They’re that comfy. 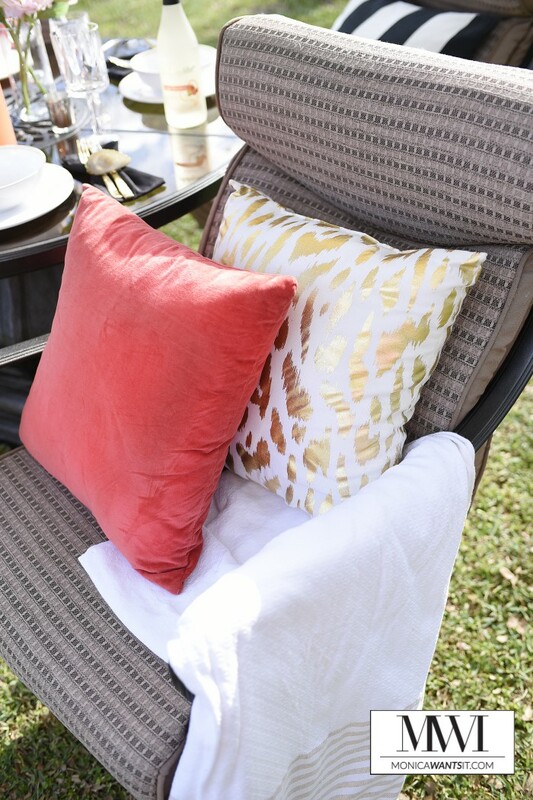 So, instead of putting off your outdoor decor dreams for another day, invest in a few pieces of decor to spruce up your outdoor space now. 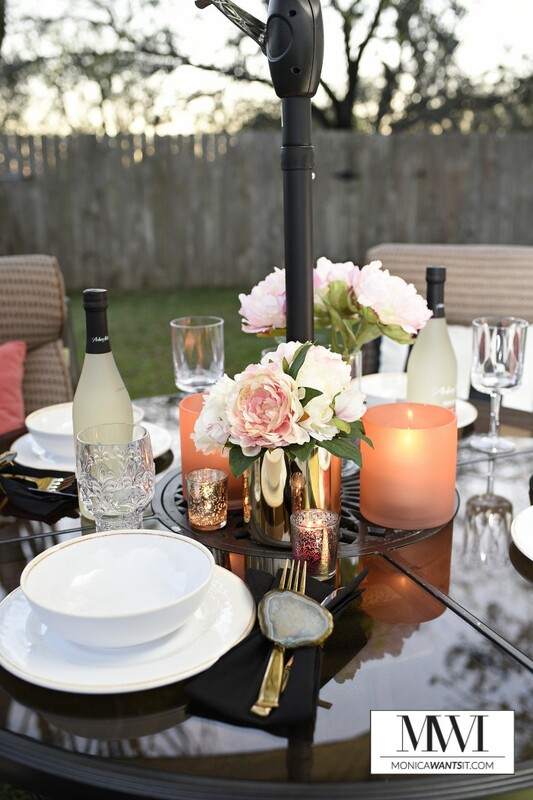 You’ll get instant bang for your buck by investing in outdoor umbrellas, dinnerware, and tabletop decor from BHG Live Better at Walmart to complement what you already have. You can shop online and in stores. You can also enter to win your very own Carter Hills 5-Piece Conversation Set in the Make it Fun! 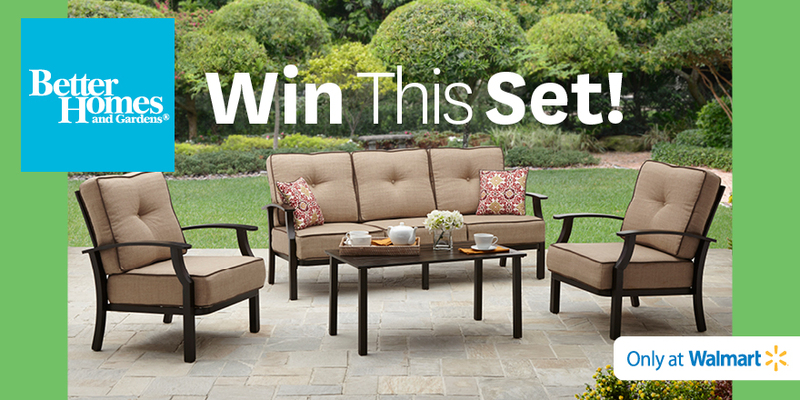 Outdoor Living Pinterest Sweepstakes happening now through March 29. Details can be found here. Good luck, and if you win please feel free to invite me over. xo. Pretty backyard, how festive. The Black and White looks great!. Monica I just cannot get over what an amazing transformation you created on a fantastic budget. The Pee Wee is SO cute. I wanted to invite you to our linky party, Thoughts of Home on Thursday. Your tour is so fantastic and I adore this wonderful post and would love to have you share it. We offer a giveaway entry for each participant. This week is a subscription to Southern Living. I hope you join in on our gathering.Happy Easter to you and yours! 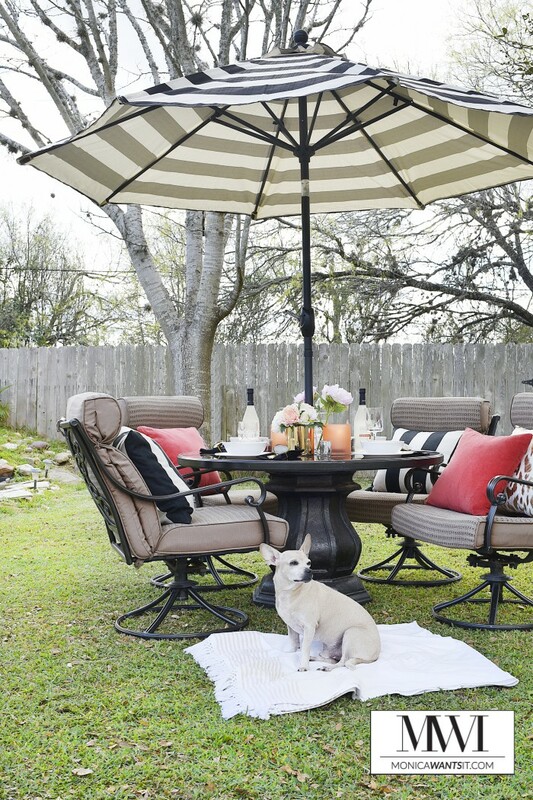 This looks great and I would never have thought to put the patio set out in the grass! I love tour backyard setup!! Can I come over? 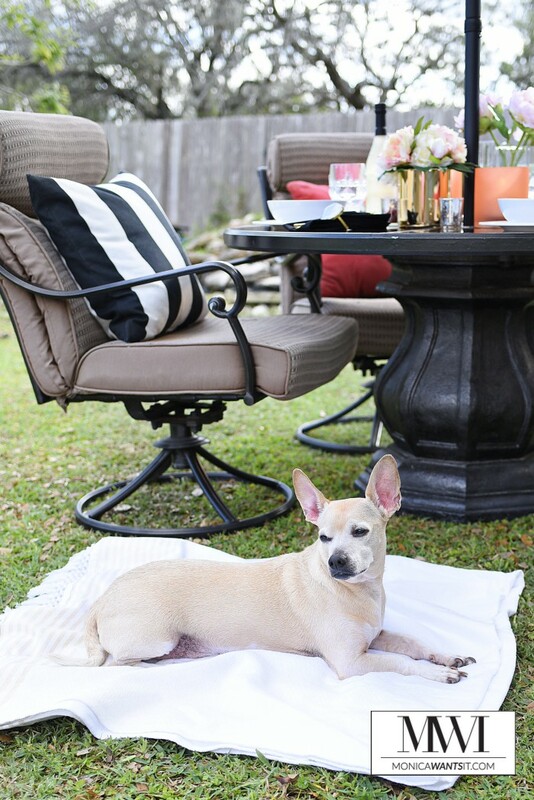 What a lovely outdoor setting you have! Too bad you can't build a gazebo for $100 because that's a project I would like to tackle this upcoming season. Backyard sanctuaries are so soothing. I love your mix of colors and patterns in the design! I absolutely love what you've done with the exterior, it looks stunning! The colour scheme I love to. P.s. Your dog is super cute! Oh I would love to have a waterfall and this setup in my backyard. You did a fabulous job with the tablescape too. I love those comfy chairs, by the waterfall looks like a perfect place to eat, relax and enjoy a good book! I really want some new patio furniture. That would make my backyard a wonderful place to hang out. What a gorgeous outdoor setup! We have been having so much fun being outdoors the last few days! $100? that is unbelievable. I love what you did! It came out great! My yard could definitely use a makeover and I love that you did it for just $100. 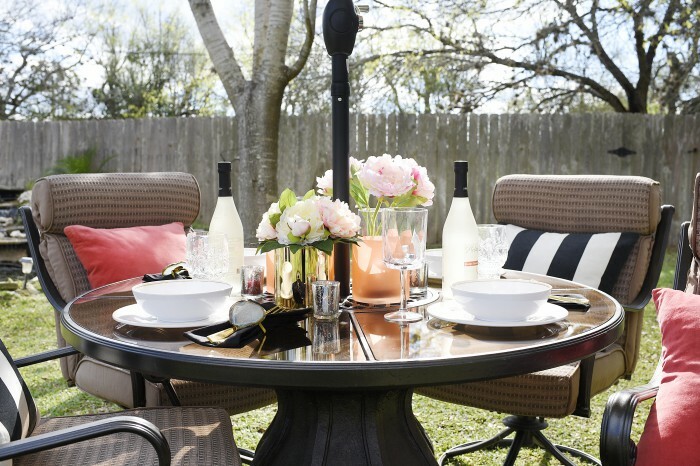 I love everything about your backyard makeover it looks gorgeous. The doggy makes the makeover look even better what a perfect model! Your set is beautiful.. 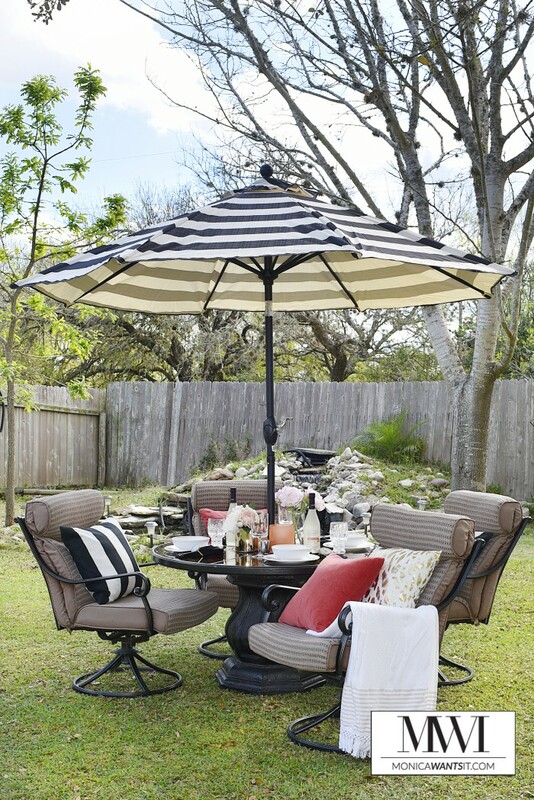 The black/white combo makes the perfect settings for your outdoor entertainment. QUE LINDA !!!!! So beautiful Monica. Love the furniture and the tablescape is so pretty. My eye went immediately to the agate napkin rings. 🙂 So your style! Pinning and sharing amiga.